SpeechLive is a cloud-based dictation solution, offering an easy, efficient, secure and flexible workflow 24 hours a day, 7 days a week, from any location in the world. 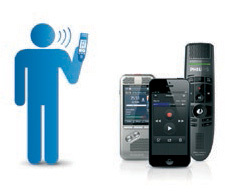 SpeechLive was developed for seamless integration with all Philips dictation devices and software, including the Philips Pocket Memo dictation recorders DPM8000 series, SpeechMike dictation microphones LFH3500 & LFH3600 series, and Philips Dictation Recorder Apps for iPhone, Android and Blackberry. Now you can create a complete workflow solution without skipping a beat. Connect with a Philips SpeechLive reseller today. Now, projects, people and tasks can stay connected from anywhere in the world. Start a dictation in one location and add to it, or let someone else finish it, from the opposite end of the globe. Securely access and share files from anywhere in the world. There is always a way to collaborate, delegate and balance workloads even if certain users don’t have access to SpeechLive. No Internet access? No problem. Users can still access all dictation projects by working in local mode to synchronize files until they are back online. End-to-end, double encryption security during downloads and uploads ensures that you are secure from unauthorized access of files. In addition, the file recovery system guards against unintended deletion of your most important dictation documents. Integrating SpeechLive is easy and can be done through a simple download from the Internet. No confusing user’s manual, IT support, or complex installation and configuration required. Setting up a SpeechLive account takes just minutes so you can start enjoying the benefits of a cloud-based dictation solution right away. Find an authorized Philips reseller in your area.